Today’s drink has been sent in by Trevor Martil. Apologies for the lack of a photo of the drink. I am sharing this at the Virtual Vegan Linky Potluck. Today’s music features two relatively new composers who are making a niche for themselves in south Indian cinema. The music for the first song clip has been composed by G.V Prakash Kumar, the nephew of A.R.Rahman. Having sung his first song in one of his uncle’s movies, G.V Prakash Kumar started his movie soundtrack composing career at the age of 16. This is a lovely song from his first movie that was released – Veyil (translation: hot sun, 2006) with playback singers Jassie Gift, Kailash Kher, Tippu and Prasanna. The next song is from Balakrishnan’s debut movie Rummy (2014) with music composed by D.Imman who started his music career in 2002. The playback singers are Prasanna and Vandana Srinivasan, a psychologist and an alumna of the London School of Economics and Political Science (LSE). Hope you enjoy the music and the drink! Blend the first four ingredients together. Add crushed mint leaves, chopped apple pieces, crushed ice and serve. 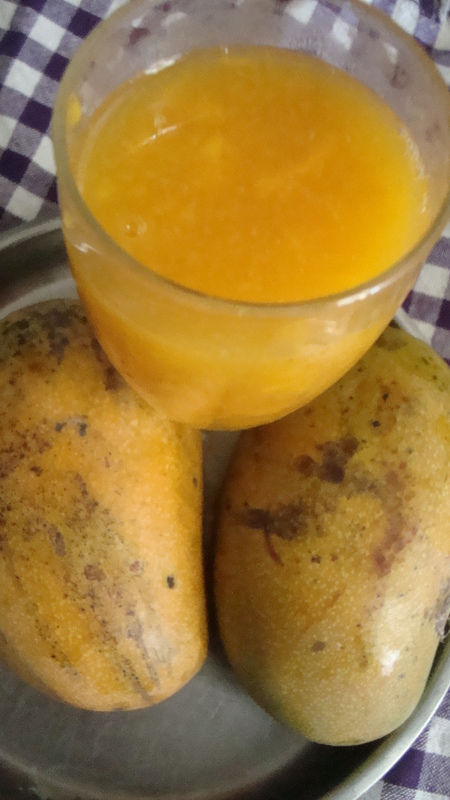 Accompanying the mango kesari is one of my favourite fruit juices – mango juice. Mangoes have high levels of vitamin C and A and a generous amount of antioxidant compounds, iron and calcium but it would be wise to consume mangoes in moderation as they are also recommended for those seeking to gain weight. 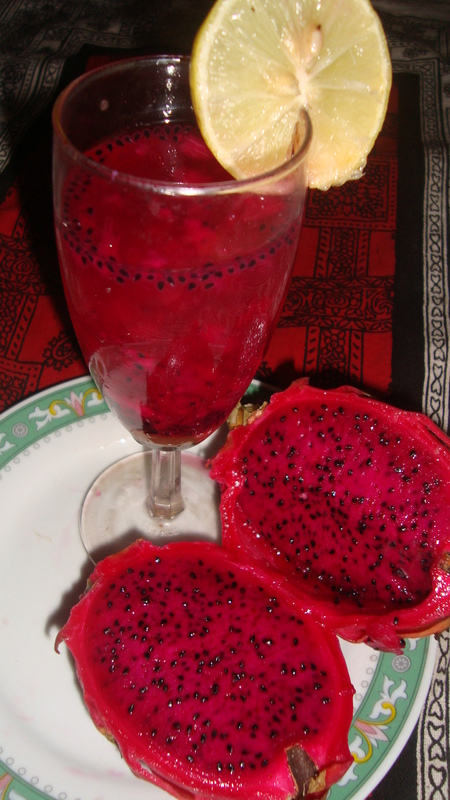 While I usually like a simple juice by blending the fruit with water, I did like my mother’s version recently. Simply blend all the ingredients together with water and then sit back and enjoy a delicious drink. 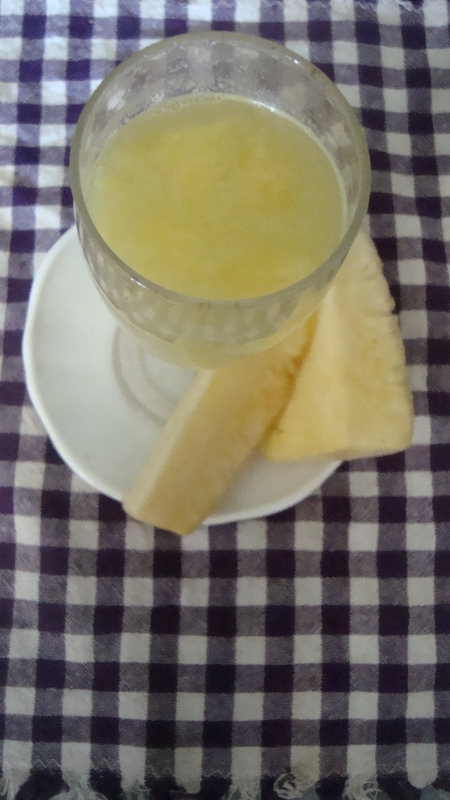 Of course, a post with a recipe for a pineapple cake has to be accompanied by a post on pineapple juice for the fresh fruit juice series of this blog. Rich in manganese, which helps in creating bone and connective tissues, and bromelain which helps in managing pain and inflammation, pineapples are an especially delicious and nutritious fruit. So go ahead and prepare yourself a glass of pineapple juice by blending ¼ cup of pineapple chunks with a cup of water and a tablespoon of sugar or less and a pinch of salt. Today’s fresh fruit juice is avocado and lime juice. Native to Mexico, avocado is also grown in Sri Lanka. At home, we generally simply eat the fruit for dessert sprinkled with a little sugar or creamed with some milk. Avocado is rich in fiber, potassium and Vitamin E. It is considered beneficial for those with cardiovascular disease, diabetes and those trying to manage their weight. It is also considered to aid inhibition and to fight oral cancer cells. 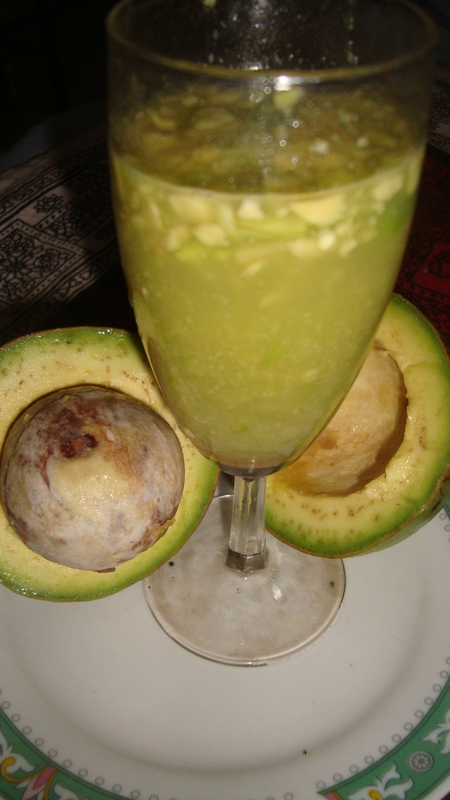 Simply blend the pulp of half the avocado fruit and the juice of half a lime with sugar to taste. 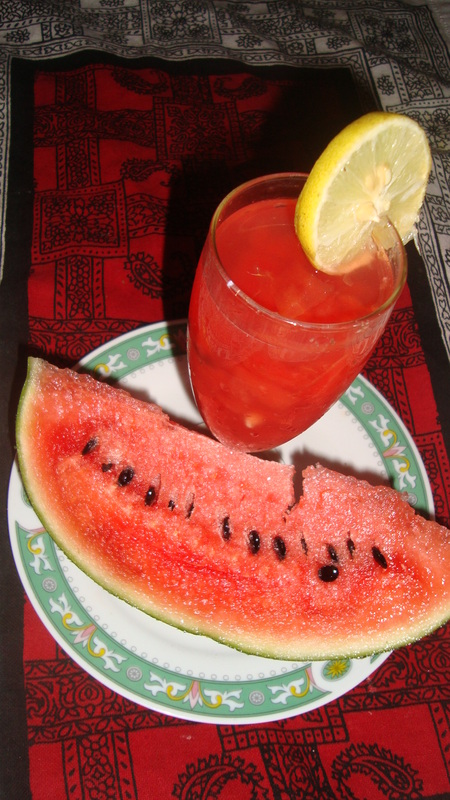 The best fruits during unbearably hot weather are watermelon and lime or lemon. So, combining both is a special treat and my favourite fruit juice. Besides instantly reducing dehydration and giving a healthy energy boost, watermelons and limes are said to be good sources of Vitamin A, B and C and good for preventing or fighting different types of cancer. So, today’s juice blends both to make a refreshing and healthy summer drink. The fresh juice of the day today is passion fruit juice. Passion fruit and Wood apple are two of the most popular local fruits that are used in almost all Sri Lankan brands of fruit cordials and jams. However, rather than consuming the processed version, it is better to go for the fresh juice as it is so readily available here. 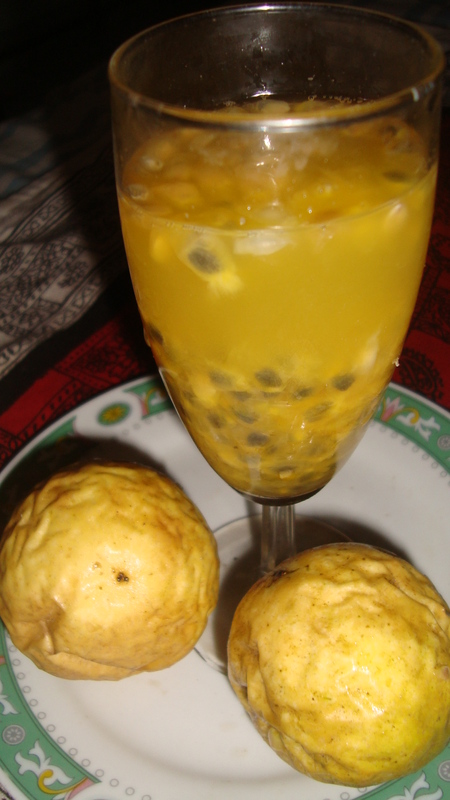 Passion fruit has a rich source of Vitamin A, C and iron amongst other nutrients. It is said to boost the immune system, improve vision, lower blood pressure and lower fats and bad cholesterol. Simply blend the pulp of the fruit, including the seeds, with some water and sugar, to taste (optional), and enjoy the healthy drink.